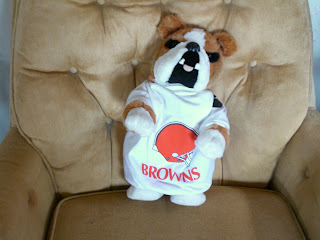 Finally, A Win for the Cleveland Browns! Which Charity to Choose? Covenant House! Unplug Your Appliances When Not In Use and Save! We Finally Did it--Got Rid of That Dark Paneling! What I'm Learning Each Day! For September we both liked Butterfly Garden by Chip St. Clair the best, although "The Glass Castle" by Jeanette Wall was a close second for Gerard. I'm so glad I took the time to browse through the books at the library and come across this one. An amazing true story about Chip St. Clair. This book is a real page turner that's full of surprises. Chip is a remarkable person! I highly recommend this book. Chip grew up being abused and not knowing his parents were on the run. Chip didn't find out until he was in college about the secrets his parents kept from him by lying to him his whole life. He realized that they were both very dangerous people and he was fortunate to have survived into adulthood. This book shows the great influence a woman can have on a man and the importance of a good woman in a man's life. Lisa helped Chip sort out his past and loved him for who he was, bringing out the best in him. Growing up, Chip found solace in poetry and art. Not until the end of the book does the reader find out the meaning of the title of the book. I agree with Gerard when he says it's a real page turner and full of surprises! It figures, the Browns win the week I bet against them. I didn't know when I picked my teams that Palmer would not be playing this game. Anyhow, I'm glad the Browns managed to win the battle of the two 0-3 teams. The Bengals really bungled it up! The funniest play of the game in my opinion was the interception and fumble all on the same play! Have you ever seen a game with that many penalties? I don't think I have. It reminded of the old familiar song, "Old McDonald Had a Farm" with a flag, flag here and a flag, flag there. Here a flag, there a flag, everywhere a flag, flag! The victory was bitter sweet for me because it meant I lost my office pool. I really wanted the Browns to win so figured they probably would if I bet against them. It worked! They have a bye next week so I won't have to choose whether to bet that game or not. Atheists Amaze Me That They Can Actually Deny the Existence of God! I came across Lee Doyles' blog last week who wrote a poem about how there is no God and that the Bible is just an old out of date book, and that "I’d rather live my life, follow my rules, learn on my own, be free." Obviously, you are not seeking after God but He still loves you and seeks after you. To bother writing this shows that you do think about spiritual things, even if at the moment you are discounting them. I give him credit for posting my comment and responding to it with his parents created him (not God) and so they were as close to a god as anything as far as he was concerned. He went on to state that there is no life after death, that's it, the end. Here is the link to his article if you want to read it for yourself. "To Your God" at http://leedoyle.com. I only ask that if you comment, you do it in love and not in a condemning way. Pray first for God to give you the right words to use. There's a website you can go to called missingmoney.com where you can search for your name and it tells you if there's any unclaimed funds that are owed to you. I tried this and it did show my husband's that we are in the process of claiming. I found out about this site at Hillbilly Heart. The Cleveland Browns lead the league with 28 penalties! (I knew they had a lot, but didn't know it was this many!) 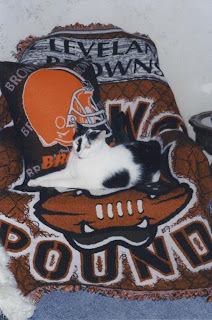 This week I'm picking the Bengals to beat the Browns. www.lightsource.com. I just discovered this today! I thought this sounded a bit dumb but was curious as to what it would say so took the little quiz for fun. It turns out that it very accurately sums up personality! The only thing is based on which purse I use, one says I am low maintenance and adapt to a variety of situations and the other says just the opposite: that I am high maintenance and feel lost outside my normal environment. This is even accurate because sometimes I adapt easily but other times I feel uncomfortable. Here are my results based on my purse I carry on Sundays. It's a cheetah that I named Spotty. It's actually a little backpack, but I use it as a purse. 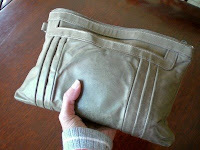 My husband got it for me because I don't usually carry a purse so on Sundays would sometimes forget it. Knowing I love animals, he figured if I had one like this, I'd remember it. He's right! I caught a cold Tuesday, the day I was off from work anyhow because of the basement floor being done but felt so miserable when I got up yesterday that I decided to call in sick. I just didn't feel much like doing anything but wanted to be better to go to my Bible study in the evening. I was told by the doctor's office I shouldn't use any kind of decongestant because of the other medication I take. Basically, I just have to suffer through it. Gerard got me a big gallon of Hi-C and I used the breath-rite nose strips and Vick's vapor rub. The highlight of my day though was napping with my cats. Spunky shared her sun spot on the floor with me and Manny let me lay on the bed next to him and even pet him without making his usual squawking noises! I think it helped me deepen our relationship! I felt worse as the day wore on so didn't make my Bible study. I went to bed at 8:30 p.m. I read in some book that if you put the Vick's vapor rub on the bottom of your feet, it helps keep you from coughing so I tried it and it worked! I had a real good night's rest and am back to work today--yea! Yesterday we got the last part of the basement floor done with Nature Stone and I am excited! When we placed the order, I thought it was so nice of them that they asked what charity we wanted the percentage of the cost donated to in our name. At first, my husband immediately suggested Caroline's Kids Pet Rescue which is the cat sanctuary we visited and the one we donate $100 a month to, mostly out of guilt for not being able to save my dad's cats. On second thought though, I just felt like we already give quite a bit to that and I'd really like to do more for the homeless. Covenant House came to mind so I chose that one instead. Covenant House helps thousands of homeless youth who are going through very difficult times get their lives straightened out. It is a charity we support monthly too but for much less. My heart breaks for youth who have such bad homes that they feel the need to run away to survive. I just hate to think of kids living on the streets when I had such a good childhood with wonderful parents and a nice home. When it comes between animals or people, I feel I must give to helping people at least as much (if you've been reading my blogs, you all know how big an animal lover I am). People are so important to God that He died for them and I want to make sure I am part of letting people know that. I read a very good book novel about homeless youth called You Can't Get There From Here by Todd Strasser. It really made me think and gain insight into how some kids live on the streets. It was good and I highly recommend it! 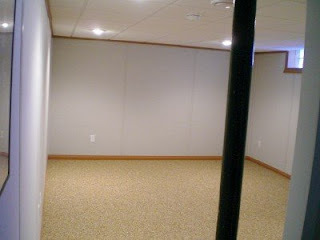 Here is our finished basement with the last section of Nature Stone done. It only took them several hours to pour the floor and then one guy came back the next day to put a coating over it which only took about an hour. We'll be able to walk on it and move our furniture back in tomorrow. I finally got the stackable shelves painted over the weekend that my dad built and used in his garage. 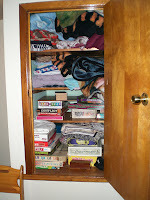 They were just the bare wood and I want to put them in my rec room so I can move the games from my hall closet to the shelves and make more room for all our blankets and comforters and throws that are currently stuffed in my bathroom closet and our laundry hamper just because we don't have enough room for them all. Be sure to check my other blog, My Funny Dad, Harry for the in-depth two-part post about this. Spunky used to play more before Manny came and I've been trying to engage her in play whenever I play with Manny so I was pleased this morning when she expressed interest in a string I saw hanging out of my crewel picture by the bed. As I was pulling it out, Spunky came back on the bed and started playing with it. It got me wondering about a couple things. Maybe she is just bored with the other string I usually use. I wonder if the string matters to cats. Maybe Spunky doesn't like the other one anymore because I play with Manny with it and he bites it now. Maybe she likes the one-on-one play, perhaps Manny being nearby is intimidating or upsetting somehow. I wish I knew. Perhaps some of my cat blogging friends could give me some insight into this. Maybe she was just in the mood to play this morning. 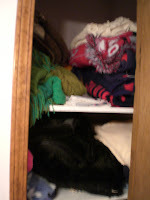 I don't know, but I enjoyed these few minutes of fun with my cat this morning before getting dressed. Hope you enjoy the video! The Patriots losing to Miami was shocking to say the least. Fortunately, I wasn't home to hear my husband yelling and stomping and throwing things today because I went to our puppet team picnic. I heard the score on the radio coming home and was surprised when nothing was broken. Gerard said he went for a walk at halftime because he had to get away from it for awhile. He's a big time Patriot fan. 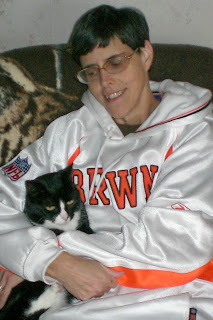 Then I got set to watch my Browns--more yelling! (No stomping or throwing anything, just some computer breaks.) I actually had hopes of the Browns winning today against the Baltimore Ravens. What was really sad is that I missed the one touchdown the Browns did have because I went on the computer for a little bit and when I came back, they had scored 7 points! It was a pleasant surprise and I was optimistic. At half time, the Browns had a 10-7 lead and I was very hopeful, almost confident in fact. I bet on my Browns with the 2 pt. spread and was doing good on all my other picks. If only the Browns could beat the spread, I'd win my office pool! Then came the second half let down filled with turnovers and penalties, including a fumble call against the Ravens that was reversed on a challenge! The Browns got an interception but didn't capitalize on it like the Ravens did. Can it get any worse? I seriously doubt it! I believe Anderson was sacked 5 times! 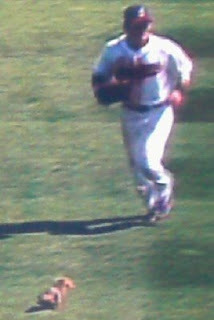 Anderson was clearly rattled and had absolutely no composure under pressure at all--at least none that I noticed. At one point he looked like a scared rabbit and other time like a deer caught in headlights. Cribbs was wide open and Anderson's pass was way high again. Does he even practice passing during the week? His throws were terrible. Maybe I shouldn't have watched since they scored when I wasn't looking. I was sure Crennel would put in Quinn to give us a chance but no. He apparently still had confidence in Anderson. In the paper this morning, Crennel was quoted as saying "Derek had had most of the work during the course of the week, and we still had a chance." Here's a thought--how about making sure Quinn gets some practice each week with the first string too so we can bring him in when Anderson completely falls apart like he did yesterday? I would like to know though why the Ravens didn't get penalized for taunting. Practically every play they made, someone was either strutting around like a peacock or one time even boxing the air! Next week we play the Bengals who are also 0-3. At least one of these bad teams will finally get a win. Browns or Bengals--who do you think will win? I am about ready to bet against the Browns. I keep hoping they will get it together. I thought for sure they could beat Baltimore since last week they came so close to beating Pittsburgh, but NO! Not today. The Spanish word for bake is Hornee--I thought that was kind of funny. I learned this from I Do Things (So you don't have to) Thanks, Daisy for telling me where I saw this at. What I type on the Internet is there forever, even if I delete it so I need to be very careful what I type. To calm down dogs during a storm, rub a fabric softener dryer sheet on them which takes out the static electricity. I read this tip in the Cleveland PLAIN DEALER this morning. Painting is tricky. Sometimes, you need to put on a grabber primer first for certain types of surfaces, such as the wall between my kitchen cupboards and counter. Even the painter had trouble getting the paint to cover and spread well and gave up. I had him wipe it off and will rethink this. P.S. The first three things listed above that I learned were from reading blogs this week. Unfortunately, I didn't bookmark them and don't remember from whose blogs these bits of information were gleaned. 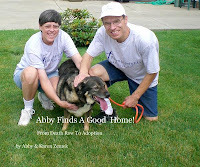 If it was yours, please let me know and I will add the link to your blog. (I should have done this right away and next time I will note it promptly.) I know "Hornee" came from a new blog (I Do Things) I just discovered that was very funny as well. It was from a post about improving on chocolate chip cookies by adding M&Ms. > TOUCHDOWN will not occur there. I was pleasantly surprised that the Browns did not get clobbered again by the Steelers; however, it was just as disheartening to see them come so close to winning but losing because the offense just couldn't score. The six points they did get came on field goals. At least we have a kicker. The other encouraging thing I saw was our punter did excellent. I felt our defense came through by holding the Steelers to just 10 points. Three dropped passes by one of our stellar receivers really hurt! Crennel is getting a lot of flak from kicking a field goal with just 3 minutes left to play when down by 7. As I watched, I know how he felt because I felt the same way. I just saw our offense blow three opportunities to score and on 4 and 7, who knows. They had been converting 3 and longs but this was over if they went for the TD and didn't get it which I believe was probably around a 97% chance of that happening. He wanted points to close the gap and then hope for a lucky TD to win the game. It could have happened too. We had the ball at the end of the game but then he didn't even have Killen Winslow, our other stellar receiver on the field! I couldn't believe it. A hail Mary completed pass and we would have won in spite of all the other blown plays, but with Winslow on the sideline, that was about a 1% chance of happening in my opinion. It was another upsetting game but I felt they definitely showed improvement over their preseason fiascoes and the Dallas game. I still have hope that they can beat Baltimore this week and enter the win column. As far as my picks went, I lost on all five even betting against my Browns because Pittsburgh didn't cover the spread. I will try again this week, can't do any worse! Well, today has been very crazy unlike a week ago when I had a "Wonderful Wednesday"! The wackiness started this morning before I even got up. I had an early morning nightmare which is extremely unusual. I dreamed Gerard was leaving me and moving to California and even though all my friends were trying to talk him out of it, his mind was made up. So, anyhow, I woke up 10 minutes late then. I dozed off on the bus and didn't even wake up when it got downtown so missed my stop and got off at the next one. Fortunately, it's only a couple blocks farther. I believe God is so good that he knows I've been neglecting my Fit TV exercising session with Gilad so he's making sure I get some extra in! Next, I return the call to Basement Systems, the company that remodeled our basement to find out my credit card had been declined. This was because it was over the limit. I wasn't familiar with what my credit card limit was because I just don't pay attention to it since we never charge that much normally, but now I know. Fortunately, I have two Discover cards so I just split the cost between them. I'm not big on having a lot of credit cards, but when my dad died, I just switched his account to my name instead of canceling it altogether to keep my book expense and ebay expenses separate. I am really looking forward to attending my Bible study tonight, but praise God none of this got to me. Looking for God's hand in things and trusting that He is in control really makes a difference! It's truly love. You have an amazing partner and a wonderful relationship. Your relationship isn't perfect, but you know how to work with each other to make it better. You both listen to one another, give freely, and do your best to make things work. While you have ups and downs like any other couple, you're good at getting through the bad times together. And although you find it easy to love your partner, you understand that lasting love doesn't come easily. You are both willing to give this relationship everything you have. And luckily, that's all it takes to make it work. Why not take this little short quiz and see what it says about you? Below is the response I received from Happy Family Matters when I asked if the appliances still use electricity even when off. Here is the explanation and I'm going to start doing this because the time when we actually use these is minimal (except for the computer which is usually in use all the time when we are home), but still, through the day when we are at work, we could be saving money by unplugging it. Here is the answer to all of them. - Any electrical or electronic equipment or appliance is still consuming electric power that is still plugged in, even if it is off. This is what we call stand-by current. Although it is very small, it is still big when you add them up. So if your Direct TV box plug is easy to reach, I strongly suggest that you unplug it. 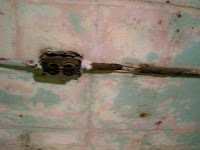 Besides, it is safer for any home when all unused plugs are removed. Thanks for finding my blog informative. 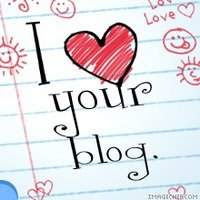 By the way, I would also like to recommend viewing my Father Blogger dot Com - http://fatherblogger.com/ as I am putting more effort on it because it is not a free hosting blog just like my other blogs. This is now my baby and I am working hard on it to serve my readers better. This short powerful video caught my attention and I feel it's definitely worth sharing so not only did I bookmark it when I found it on The Night Is Coming by Roger DJ but also decided to post it on my blogs as well. I got goosebumps watching it! Please take a look and watch all the way to the end to get the full impact. I'm curious to know what you think of it. I learned a city dog lives an average 3 years longer than a country dog. This surprised me because I would think a country dog would get more exercise so would help it live longer. At work today, I learned a new system for opening new clients--sat through two hours of training for this one! On Thursday, my morning devotions have gotten longer since I am going through "Living Beyond Yourself" by Beth Moore. Before we can be filled with the spirit, we have to empty ourselves. The basic steps are Pour out, Pour In, and Pour Forth! I read on Happy Family Matters that it's good to unplug electrical things after using them such as the TV, washers, computer. Apparently, even when things are plugged in even if they aren't on, they still use electricity? I'd like some confirmation on this before I do it. Anyone knowledgeable in electricity that could confirm this? StumbleUpon 101--The Web Made Simple. Specifically, I learned that (1) by clicking on the Stumble button on my tool bar, it shows me sites that are related to the interests that I submitted; (2) submitting your own content is not a good practice. How about sharing something you learned this week in a comment? 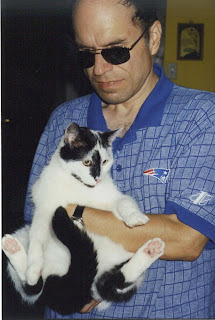 This morning when I went to www.theanimalrescuesite.com to click on it to provide free food for shelter animals, I saw my cat, Moe, was featured on the home page! It was such a nice surprise! 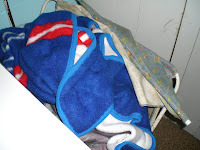 I washed our doggie throw and laid it across our table and chair in my den to finish drying. With all the construction going on in the basement, Spunky Doodle and Manny both retreated to my upstairs den, probably to get as far away from all the noise and commotion as possible. 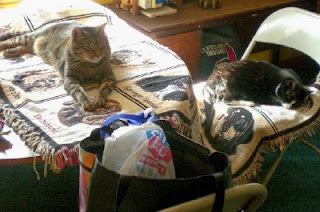 We discovered them napping together when we went up there late afternoon (Manny on the table and Spunky on the chair). Ever since I saw this fabric type wall that makes the basement look brighter at the Home and Flower Show about 4 or 5 years ago, I planned to get it for our basement. 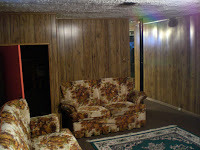 Our basement had paneling that is buckling and dark. I hate to see what's behind it after all these years. When we first got the estimate for between $15,000 and $20,000 after seeing it at the Home and Flower Show, I was floored and pretty much decided we couldn't afford it so gave up on it until last year when my dad died and I sold his house. After buying a new KIA, I put the rest into our savings with $20,000 earmarked for those basement walls and ceiling I wanted. 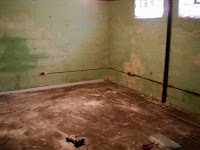 So, thanks to my dad, we are able to fix up our basement real nice. I think he'd be happy with the way we're using his money. Eww, it really looks ugly! 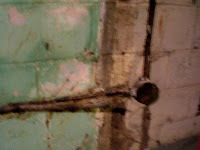 The kitchen sink pipe looks like it should be replaced! YIKES! Finding this was a bit scary . . . a hornet's nest in the rafters! This wiring looks really bad. It's a good thing we're doing this! The good news is there wasn't the mold that we expected would be there and it will be very nice when it's all done. The problem with remodeling is moving out all the furniture and not being able to use the room for awhile. 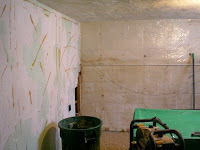 After the walls and ceiling get done by Owen Corning Basement Systems, then we will put down the nature stone in the last part of our basement. We did it in sections because it's quite expensive. That means we'll be without our second TV for almost 3 weeks and there's no sense in moving the furniture back until after the floor gets done too. 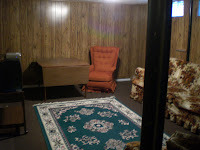 To top it off, we are also getting new carpeting in our living room by basement systems. They said they would move the big furniture items for us with no extra charge so we agreed to let them do it. Our living room carpeting is probably at least 13 years old and it's faded and stained. I hope this can wait until after the basement floor gets done because we really need our TV! 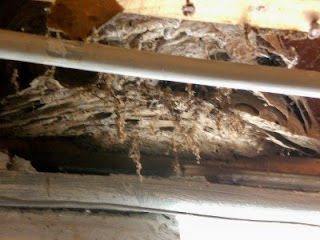 When the Basement Systems guys came to start our basement remodeling, I got to see what a hornets nest looks like. Right there in my basement rafters, hidden above the ceiling was a foot long nest. We were all afraid to go near it and the remodeling guys didn't want to touch it either so I called several pest control places. Fortunately, I got one that had a guy in the area who came by in half an hour to take care of it. He said it was dead and just got a broom to knock it down. We all felt a bit silly then, but I asked how he knew it was dead. He said because there was no activity going on around it. Normally, there would be hornets flying in and out. I asked how he could tell if they weren't all just out and would be back and he said because the queen and her drones would all stay and there would be some flying around it. I was very relieved that we didn't have hornets in my basement. Here is what it looked like--big, brown, flaky ugly thing. Lots of cool things related to the zoo. See my post: "Being Seniors Today"
There is a Fantasy Football consultant that actually does this for a living. When our TV picture disappears and just unplugging it for 30 seconds and plugging it back in doesn't fix the problem, unplug the Direct TV box and plug it back in. Then it worked! 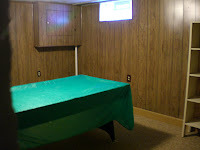 Mold build-up behind the paneling is what causes the mildew smell in the basement. man door: It's a regular door that has a door knob. I just decided to start doing this so I had to try thinking back to things. This week I'll do it as a draft and list the things as I learn them which will be a more comprehensive list. On the way to running to my bus stop this morning (as usual), a tiny bunny rabbit ran along with me, sort of. It actually was a bit ahead of me which spurred me on to run faster, being the competitive person that I am. I tried to outrun the rabbit. I actually did it and felt victorious because the rabbit stopped first and I passed it right by. This "event" jogged a long-time memory of something I used to do when I was around 4th-5th grade. I was never much of a bike rider, partly because we weren't allowed to really go anywhere on our bikes except our own street. At least we didn't. In my head I imagined a finish line up about 6 houses from my driveway. We lived near the end of a street so when a car turned onto our street, I would zip down the drive and head for the "finish line," racing against the car. Sometimes I won, sometimes I lost so felt it was a fair race. This got me thinking of some other silly things we used to do for entertainment as kids. On hot days when we were just sitting on the porch, we would play "Who You Going to Marry?" This is really just people watching. We took turns and if someone walked by or drove by when it was your turn, that was who you would marry and the kind of car you would have. Very simple game, the only exception was that my brother got all the women. Even as kids we knew marriage was between a man and woman! Too bad adults always complicate things. Another fun game we used to do in our backyard that really destroyed what little grass we had didn't even have a name. I loved ball and would bounce a rubber ball against the garage and field it and throw again. This is how I practiced fielding. Well, my friend and sisters and brother started riding their bikes threw my little practice session and it turned into a fun game. They would try not getting hit with the ball and I would try to hit them with it when it bounced of the garage--I didn't throw directly at them. After all, that would be too easy! Swing sets can be made more fun too. Just swinging is okay, but I am one who likes games. When we'd go to the park where there was a swing set, three of us would swing with one of us standing at each end of the set. We would roll a ball, similar to the kind used in dodge ball under the swings, trying to get it all the way through. The ones on the swings would try to kick it as it went by, scoring a point if they succeeded. After awhile, we took turns rolling the ball through and whoever had the most points after everyone had a turn throwing, won. Very simple, but really fun! I didn't care for swimming but found a fun use of our backyard pool. It was fun to play with my army men in the water. They never sank and we could make them swim by making waves in the water. I'd use the floating styrofoam boards as islands. Of course, army men were fun to play with on land too, but most kids do that. In the water was different. I had quite a few marbles too. My brother and I would sometimes play marble war. We split the marbles in half and set them up in a formation at either end of a carpeted room. 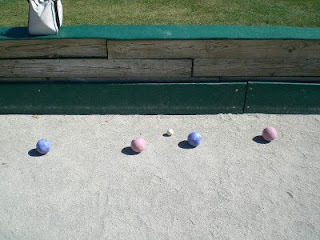 Then one at a time, we would roll one marble our and aim at the other's marble to try to hit the other's marble first. When your marble got hit, it was eliminated. The one with marbles left the longest was the winner. Gerard liked playing baseball every day, hide-n-seek in the dark with a flashlight outside with his friends (called it "Spotty") and some kind of tackle game which he was very good at because he was so big. It took four kids to get him down so that was one game where he was always chosen early! 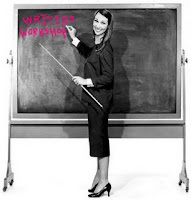 Linked up to Mama Kat's Writer's Workshop for the prompt: Childhood memories--What you liked to do as a kid. We went to the Yankee Peddler Festival today. Pretty neat! It's in the woods and is like a big craft fair with lots of food. Unusual things that you normally do not see at a mall made by artisans/crafters. People dress up in old-time clothes and they have puppet shows and music going on all day!! The puppet show we watched was very funny. Gerard found a nice Benedictine Bengals (his high school alma mater) sign we bought and Karen bought some chocolate peanut brittle she enjoyed. For lunch we had apple fritters and strawberry shortcake! YUMMY! They have it every year so we'll probably go next year too. Didn't get lost either and it took only about 45 minutes with our trusty GPS! We tried going in 2006 following Mapquest directions which took us so far out of the way that we never made it. We drove for an hour and weren't even close so just came back home. A two-hour drive for nothing! That was the last time I used Mapquest. I love my GPS. When we went shopping on our anniversary at Walmart Saturday, Gerard looked in the clothes section while I went to buy some shelf paper to make my race track for my new Sunday School scripture challenge race. Anyway, he spotted a really pretty blue polo shirt and although it's not like he needs another shirt, it was marked down so I encouraged him to buy it. I told him he should get a small. He used to get XL long, long ago, then large, then lately medium, but I really think a small would fit him just right. He couldn't believe he could fit into a small and was very proud of himself so here he is. A picture of him in his new SMALL shirt. I am always interested to get letters from the parents of the group home I sponsor at Boys Town. It's rewarding to see the impact my little bit of money that I send each month has and it helps me to know how to pray more specifically for the needs of the boys. The group home I help support is run by Tony and Simone Jones. The boys currently living there are Ned, Ivan, Dale, Darius, Gordon, Aaron, Malcolm and Chad. These are boys who've had a very hard childhood and now are getting love and help so they can have a bright future. I do not know how long these guys have been at Boys Town, but I do know that they now have a good life. Most of the boys are actively involved in sports, some work and are preparing for careers. They enjoy fun activities and learn basic life skills, character skills such as honesty and trust. This is a very easy way to have a small part in making a huge difference. If you would like more information about becoming a monthly sponsor, call 1-800-547-0093 or write to: Father Flanagan's Boys' Home, P.O. Box 5400, Boys Town, Nebraska 68010-9908. I want to thank Tahtimbo at Everyday Living for this nice award. It's always encouraging to hear that people like my blog and I am honored to accept another award; however, I have received so many now that it's hard to find different blogs to pass them along to. 1) Hipp is My Middle Name Although this blog does not have an Entrecard, I found it indirectly through Entrecard. This is the wife of Tony at Seeking Things Above. Her blog is about their family with cute pictures. I enjoy reading about other families so I like it. 2) Love, Romance and Relationships This is a blog I just recently discovered through Entrecard that I enjoyed reading because of all the suggestions it has to strengthen relationships. I thought it was quite interesting! 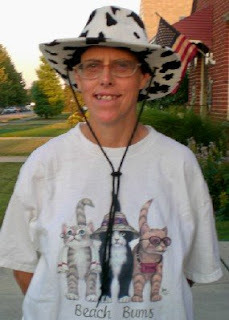 3) Cat on My Head I enjoy reading this blog because of the very unusual posts that happen to this person. It's very humorous and I really love her header picture--you've got to see it! 4) Life Blog Magazine This is another new site I recently discovered through Entrecard that has some interesting Christian related posts. 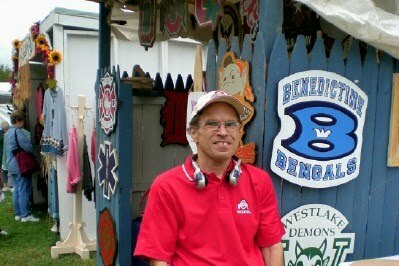 5) Doug at Retired and Restless This is a relatively new blog I discovered through Entrecard and enjoy reading because it's about everyday things and is well written. He just posted his 100th post! 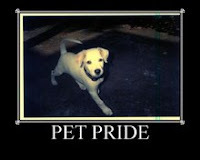 6) Holy Cuteness This is a great blog if you like animals. It just has cute animal pictures every day. 7) Measure Twice, Cut Once I like this one because it's written by a dad who works hard and lets his kids help. Some of the things I've read about remind me of my dad. I mark events/birthdays including age/appointments with times on one main calendar that I see every day--it's in the kitchen. This way, it is easy to refer to and be reminded of when things are happening. 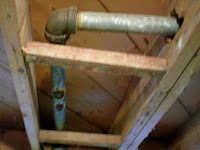 Also mark when you do house repairs such as getting a new roof or furnace, etc. Then copy that onto your subsequent calendars and you can easily tell how old your things are. Today we used the free Club Seat tickets for the Cleveland Indians baseball game that I got from work. It's one of the perks I get. If a client isn't using the tickets, then employees can request them, so I put in for the day game today against the Chicago White Sox. It was a beautiful day again and Gerard and I ate very well. The food is free because it's included in the ticket price! It's an all you can eat buffet and they also bring around popcorn, hot dogs and Cracker Jack to the seats! We had burgers, pizza, ice cream, sorbet, popcorn, Cracker Jack, pop, lemonade and water. 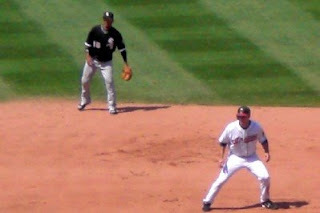 Although the Indians lost 4-2, my favorite player, Grady Sizemore got on base and scored. The highlight of the game though was the squirrel running on the field and watching the players and security chasing after it! They even put a close up of the squirrel up on the scoreboard while a squirrel song played and everyone's attention was on that squirrel! It was so funny! Finally, a guy came out with a net and got booed by the crowd for removing the squirrel. 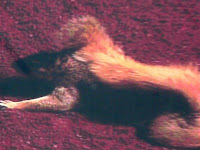 When the eighth or ninth inning came up, a picture of the squirrel was put up on the scoreboard again with a big "S" superimposed on its chest with the title, "rally squirrel." It was a very fun time! Tonight, I start a women's Bible Study on the fruit of the spirit by Beth Moore. Tuesday, we started off our day with breakfast at Eat-n-Park enjoying the senior buffet for under $5! This is our first ever "senior" special. It was very good! 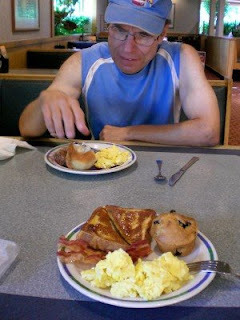 I love breakfast food best anyway so had three plates which included scrambled eggs, toast, strawberries, French Toast with maple syrup, Small pancakes with blueberry syrup, bacon and a blueberry muffin. It may not be the healthiest breakfast, but it sure is the best! YUM, YUM! 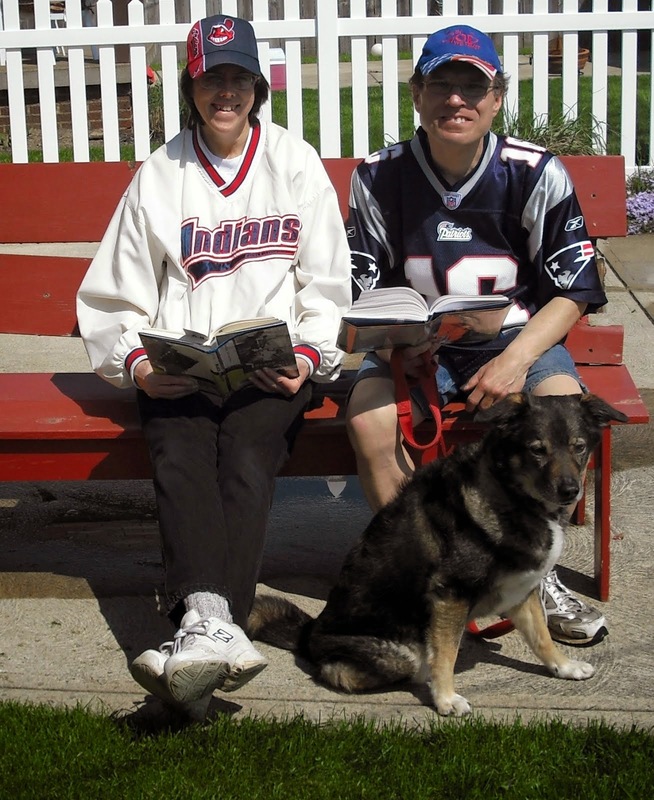 Then we walked to the library next door to renew the book I'm reading ("Relentless Pursuit"). 1) The stone fish looks like a stone! It is the most poisonous animal at the zoo. I asked if it was even more poisonous than the little pretty frogs and Mary said yes, because the frogs at the zoo are not poisonous because they need a special type food to make their poison and they don't get it at the zoo. 2) The male giraffe was moved to a different zoo because his daughters are all here at the Cleveland zoo. They didn't miss him, but were more interested in the extension being built onto their building. 3) The elephants were being moved to the Columbus zoo today but their keepers get to move with them and still be their keepers at the Columbus zoo for 3 years until they return to the new Cleveland exhibit. 4) Most of the animals are taken inside at night for their safety. Some people in the past have actually shot at them when they used to be out at night. Very bad people! 5) The big cats get the same kind of shots that our pet cats get annually. 6) The most boring animal in the zoo is the Koala--sleeps 20 hours a day! 7) Monkeys do not like water. That is why they can be put on little islands with no fences. The only monkey who likes the water and is the exception is the swamp monkey. There was more stuff than this even that we found out, but at the moment, these are the things that stand out. Mary was very interesting and we were fortunate to be at the right place at the right time to meet up with this nice group--no one shooed us away and several said they liked my hat and Mary liked my cat shirt! We are both on vacation this week and Labor Day was very fun! We played tennis early which is my best time of the day at the neighborhood courts. When we played there on Sunday, I won 6-4 and Gerard won 6-2! I was very thirsty, hot, and getting hungry so really couldn't focus and grew frustrated as I got more behind, which I'm not used to. I just wanted the games to go quick so if Gerard got ahead, I just enjoyed banging the ball and didn't care if it went out or not. Once it got stuck high in the chain link fence, I hit it so hard. It was actually pretty funny, but Gerard didn't want to win that way so we postponed the third set until the next day and ordered our pizza for lunch. Monday, when we played, I won 6-1. 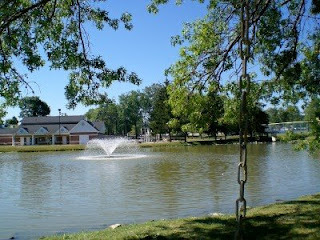 After tennis, we went to Elmwood park and relaxed on the swing by Elmwood Pond in Independence, Ohio. We used to go here often before we were married. I took a book along and we enjoyed some time on the swing. 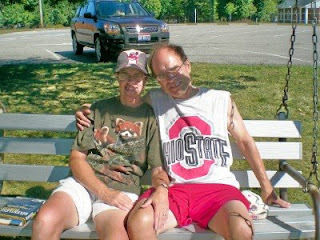 The Ohio State shirt Gerard is wearing was found at the neighborhood tennis court when we were picking up all the litter left by the basketball players on Sunday. No one was there but us so he took it. 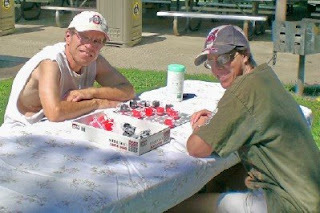 We brought along our Ohio State checker game and a sheet to cover the table to play some checkers which Gerard is best at. This is the one game he can consistently win. He won the first game but I managed to win the second one. The tie-breaker he won so that was good he won something! It was a very nice day and later I finally made it to the computer to do my Entrecard drops AND play some pogo too! Finally Getting Rid of the Old Ugly Mustard Color! Today is the day I finally quit procrastinating and just do it! 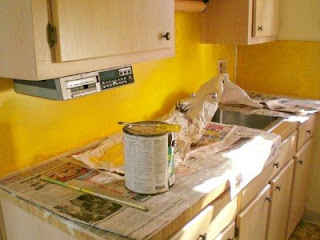 Since we've moved here almost 11 years ago, the kitchen had the one wall by the counter top an ugly mustard color. I figured that since I painted the upstairs bathroom and a basement cupboard that since it was only a small area, I could just do it myself and save some money. I already had the yellow paint leftover from when I painted the upstairs bathroom. The difference though is that for the bathroom and cupboard, I used the roller but for this wall in the kitchen, I have to use a brush. I am finding that it is different. Not only doesn't it go as fast, but I can't seem to get it on even and my strokes show! I'm hoping that once I go over it with a second coat, it will be okay, but if not, I'll be calling Handyman Connection again! I'm guessing the Website worth is similar to a Technorati based blog worth technique that I used for a bit on my blogs. The creator used Technorati's information on links into a blog to come up with a blog worth figure. I don't think it really is what you sell the blog for, but it's a fun tool to watch the figure go up as more sites link to you. After I joined in the World Record Big Bang meme, my blog's worth sored to over $100,000, and I know it's not worth near that. 2nd question about daily ad revenue - I don't know but it could mean what you could expect to make if you ran Adsense or some other ads, based on your blog's traffic etc. But I'm not sure. 3rd question about daily pageviews. Either it's a mistake in their programming or maybe they have it mislabled because it sounds like your actual pageviews total is very close to what they're showing for a day. I do know that pageviews are more important than "visitors" numbers. I read somewhere that pageviews are the stats you want to pay attention to, as it shows the number of pages on your blog that were actually read, and if it's higher than your visitors totals, that means people are looking at many pages within your blog, and not just popping in and leaving right away. We thank all our August commentators for their participation on this blog. We enjoy your comments and hope you find things of interest here.